This antibiotic is a broad spectrum used for the treatment of bacterial infections of the respiratory system. Add one level teaspoon of Enrofloxacin to one gallon of clean drinking water for 4-6 consecutive days. Change water daily. Not for use in young birds less than 21 days old. 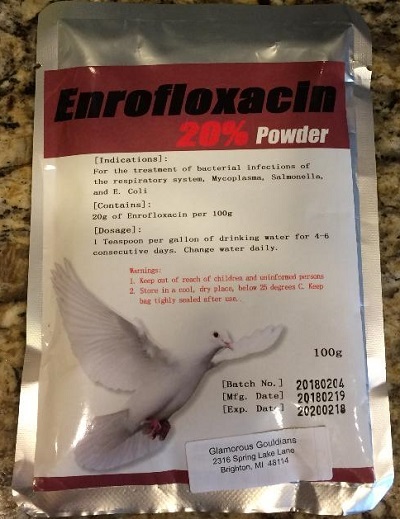 To reduce the development of drug-resistant bacteria and maintain the effectiveness of Enrofloxacin and other antibacterial drugs, should only be used to treat or prevent infections that are proven or strongly suspected to be caused by bacteria.